Sorry... the 2017 BMW 740 is no longer being sold as new. 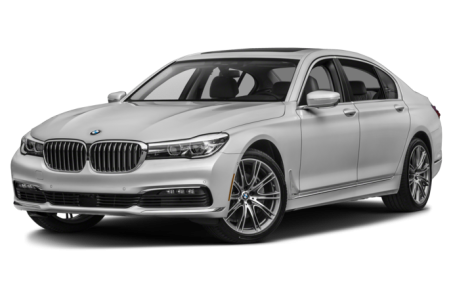 Instead, take the first step to a great deal on 2019 BMW 740 with a free price quote! A redesigned, sixth-generation 7 Series debuted last year. The lineup for BMW's flagship sedan consists of the six-cylinder 740i and the V-8-powered 750i. Both are available with rear- or all-wheel drive. Competitors include the Mercedes-Benz S-Class, Audi A8, Jaguar XJ and Lexus LS. An all-wheel-drive version of the 740i has been added for 2017; initially, the 740i came only with rear-wheel drive. Meanwhile, the Display Key, which includes an LCD touch-screen, becomes standard. The key can operate the locks, windows, climate system and other functions within a 985-foot range. BMW will add an all-wheel-drive 740e plug-in hybrid for 2017, too. It will have a turbocharged 2.0-liter four-cylinder engine, an electric motor powered by a lithium-ion battery, an eight-speed automatic transmission and an electric-only range of about 23 miles.